Remember Ratt? Hair metal band from the '80s, had a hit called "Round and Round?" Well, now it's a wine. Ratt drummer Bobby Blotzer was showing off his "Ratt N Roll" Sonoma Coast Chardonnay 2010 ($20) at the Family Winemakers tasting on Sunday. Kristian Story made the wine for Blotzer's specifications, which, for a heavy metal guy, start with a surprising dictum: "A lot of people think Chards are too heavy," Blotzer said. "I wanted this to be light." Blotzer and I talked for a while about wine, and I talked with Story as well. But it wasn't until I talked with Antonia Quast, vice president of Kristian Story wines and Story's girlfriend, that I learned the real reason Ratt N Roll Chardonnay has 100% malolactic fermentation. Story's business plan is an interesting one. 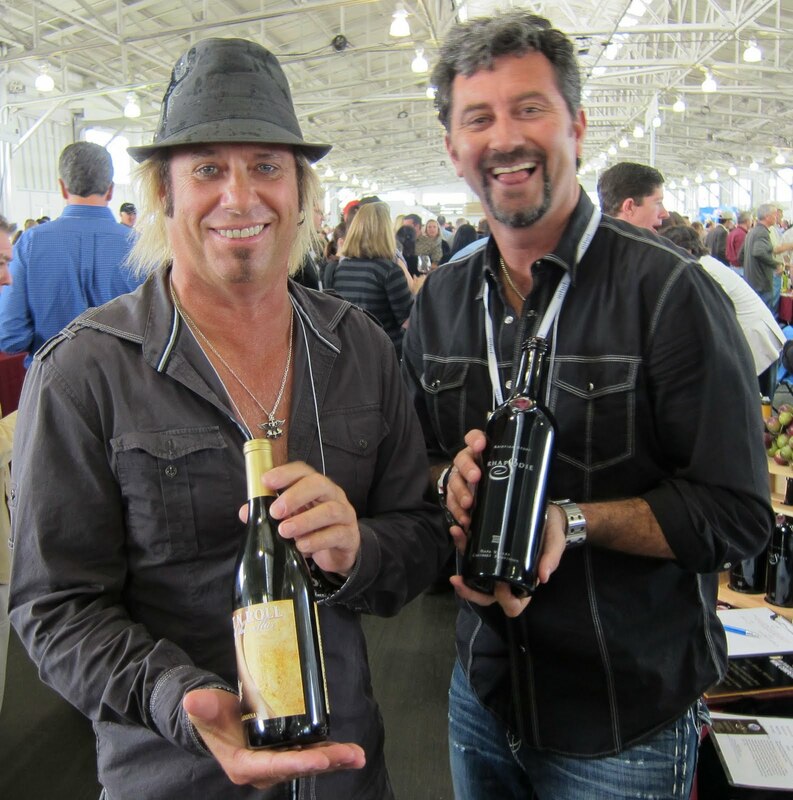 He makes wines with his name on the label, but he's also making wines for musicians. 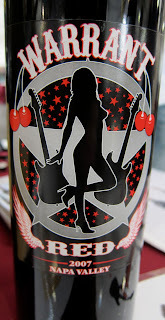 He made a red wine for Warrant, but couldn't call it Cherry Pie after the band's most famous album because Jayson Woodbridge, whose Hundred Acre makes a Pinot Noir called that, threatened to sue. So he stayed as close to the album design as he could without getting sued by Sony Music, and he sold out immediately when Warrant's former lead singer Jani Lane was found dead earlier this month. Fans nearly overwhelmed Story's site to get the wine as a memento. Story's first "celebrity" wine was for an obscure baseball player named Roric Harrison, who pitched parts of five seasons in the 1970s. Based on that, and on another he did for a tech company president, he was approached by a group in LA that had made a Gene Simmons wine, and wanted to do a better job for Warrant. Even though Kiss fans are still legion, the Simmons wine was "a one-hit wonder," Story said. "They used Temecula fruit. It didn't have any flavor," Story said. 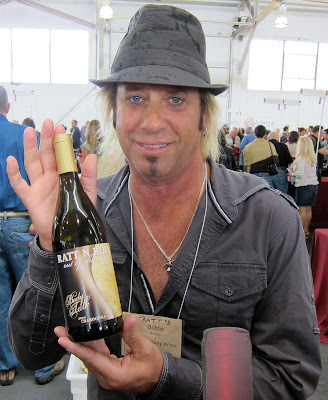 I didn't try the sold-out Warrant wine, but I did sample nearly identical Chardonnays Story made for Ratt and for LA radio personality Richard Blade. The main difference is that Blade's wine was 70% fermented in stainless steel, 30% oak, whereas Ratt's was 50-50. 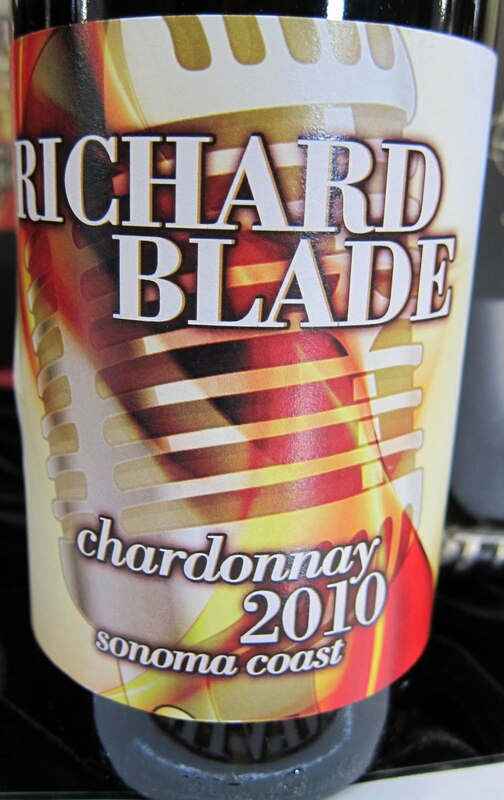 I much prefer Richard Blade Sonoma Coast Chardonnay 2010: both it and the Ratt Chardonnay have nice floral notes, but there's more fruit on the Blade wine and it's brighter and cleaner. However, I'm not Ratt's target audience. "Richard's is more of a food wine," Quast said. "Bobby wanted a little bit more 'cougar crack' because the women he has spent time with like that." Blotzer and Story: Bring on the cougars! Cougar crack? Turns out that's Napa Valley's new insider term for buttery, low-acid, slightly sweet Chardonnays, especially from Rombauer, which is most famous for them. Older women are particularly fond of the style. I had to confirm that with Blotzer, who's 52 now. But I had to wait while a couple of cougars had their pictures taken with him, drank wine with him, put their arms around him, and just generally pawed the merchandise. I might have waited all afternoon if I hadn't enlisted Story to pull Blotzer away. But I'm sympathetic to his priorities, and the display made me wish I'd become a drummer rather than wasting my randiest years as a writer. "So is wine the new way to get laid? Is it more effective than being in a band?" I asked. Blotzer laughed. "I hope so," he said. "I'll let you know tonight." :)))))))))))))) I pass on the wine but fun story, now I'm off to pour some red wine into the correct size Mason jar. Great one, Blake. "Cougar crack" is a keeper. From a long-time Ratt-n-Roller, though, it's "Blotzer" not "Blatzer."